Home Your medical guide	OsteoArthritis or OA – what is it? Arthritis is a general term that means inflammation in joints. Osteoarthritis, also called degenerative joint disease, is the most common type of arthritis. It is associated with a breakdown of cartilage in joints and can occur in almost any joint in the body. It most commonly occurs in the weight bearing joints of the hips, knees, and spine. It can also affect the fingers, thumb, neck, and large toe. It usually does not affect other joints unless prior injury or excessive stress is involved. Osteoarthritis affects millions of people. The chance of developing the disease increases with age. Most people over age 60 have osteoarthritis to some degree, but its severity varies. Even people in their 20’s and 30’s can get osteoarthritis. In people over 50, more women than men get osteoarthritis. Osteoarthritis is not associated with fever, weight loss, or anemia (low red-blood cell count). If these symptoms are present in someone with osteoarthritis, they are caused by a condition unrelated to the osteoarthritis. There are several factors that increase the risk for developing osteoarthritis, including heredity, obesity, injury, or overuse of certain joints. 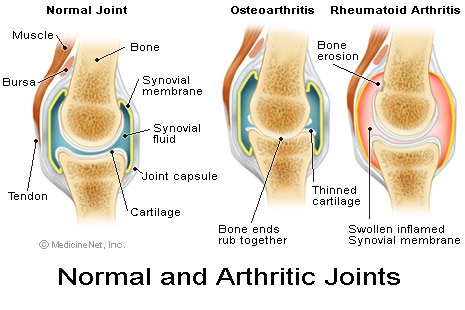 People born with joint abnormalities are more likely to develop osteoarthritis. Being “double-jointed” also increases the tendency to develop osteoarthritis. Some people have an inherited defect in one of the genes responsible for making collagen, a major component of cartilage. This causes defective cartilage, which leads to more rapid deterioration of joints. Finally, people who are born with an abnormality of the spine (such as scoliosis or curvature of the spine) are more likely to develop osteoarthritis of the spine. Obesity increases the risk for osteoarthritis of the knee. Maintaining ideal weight or losing excess weight may help prevent osteoarthritis of the knee, or decrease the rate of progression once osteoarthritis is established. Injuries contribute to the development of osteoarthritis. For example, athletes who have knee-related injuries may be at higher risk of developing osteoarthritis of the knee. In addition, people who have had a severe back injury may be predisposed to develop osteoarthritis of the spine. People who have had a broken bone extending into the joint margin are prone to develop osteoarthritis in that joint. Overuse of certain joints increases the risk of developing osteoarthritis. For example, jobs requiring repeated knee bending increase the risk for osteoarthritis of the knee. Your doctor may use X-rays to help confirm the diagnosis and rule out other types of arthritis. X-rays show how much joint damage has occurred. If fluid has accumulated in the joints, your doctor may remove some fluid from the joint (called joint aspiration) and examine it under a microscope to rule out other diseases. While there is no blood test to diagnose osteoarthritis, some blood tests may be helpful to rule out other types of arthritis. Osteoarthritis is usually treated by medications, exercise, application of heat or cold to the painful joint, use of supportive devices such as crutches or canes, and weight control. Surgery may be helpful to relieve pain when other treatment options have not been effective. The type of treatment prescribed will depend on several factors including the person’s age, activities, occupation, overall health, medical history, and severity of the condition. Medications may be prescribed to reduce pain caused by osteoarthritis. Pain-relieving drugs include acetaminophen and nonsteroidal anti-inflammatory drugs (NSAIDs), such as aspirin, ibuprofen, or naproxen. Some medications in the form of creams, rubs, or sprays may be applied over the skin of affected areas to relieve pain. Unfortunately, drugs do not reverse or slow the progression of joint damage caused by osteoarthritis. When you are prescribed any medication, it is important to meet with your doctor regularly so he or she can detect the development of any side effects. How Do Weight and Exercise Impact Osteoarthritis? Staying at your recommended weight helps prevent osteoarthritis of the knees, reduces the stress on weight-bearing joints, and reduces pain in affected joints. Once you have osteoarthritis, losing weight also can relieve the stress and pain in your knees. Exercise is important to improve joint movement and to strengthen the muscles that surround the joints. Gentle exercises, such as swimming or walking on flat surfaces, are recommended because they are less stressful on your joints. Exercises that strengthen the quadriceps muscles reduce knee pain in patients with osteoarthritis. Avoid activities that increase joint pain, such as jogging or high impact aerobics. If you have osteoarthritis, heat or cold treatments may be recommended to provide temporary relief of pain and stiffness. These treatments may be given in the form of a hot shower or bath, or by applying heating pads or cold compresses. Supportive or assistive devices may be helpful to decrease pressure on joints in osteoarthritis. Knee supports may be helpful for some people to stabilize the ligaments and tendons and decrease pain. Canes or crutches may be helpful to take pressure off certain joints. When Is Surgery Necessary for Osteoarthritis? When osteoarthritis pain is not controlled with medications or other mentioned treatments, or when the pain prevents you from participating in your normal activities, you may want to consider surgery. Arthroscopy to clean out the damaged cartilage, although recent studies question the effectiveness of arthroscopic surgery for treatment of knee osteoarthritis. Joint replacement surgery to replace the damaged joint with an artificial one. Even under the best of circumstances, surgery cannot return the joint to its normal state (artificial joints do not have all of the motion of a normal joint). However, an artificial joint will very likely diminish pain. The two joints most often replaced are the hip joint and the knee joint. Artificial joints are now also available to replace shoulders, fingers, elbows, and back joints to treat severe pain that has not responded to other treatments. Joint fusion (arthrodesis) fuses the two bones on each side of the joint. This is done more often in areas in which joint replacement is not effective, such as the ankle. Nowadays, even younger generation can be diagnosed with osteoarthritis. The cause can’t be related to just one factor however there are preventive measures that can be taken. One simple way is by increasing the amount intake of Omega 3 fatty acids. Thank you for your valuable comment, Dr Nicholas E. I am planning to follow up this post with a Q&A about OA. Do visit often. It would be wonderful to have a guest post from you on this blog.